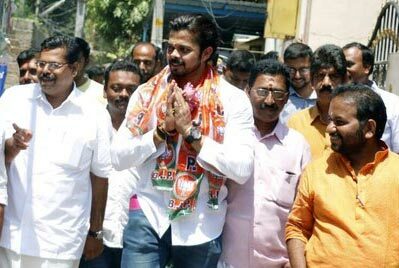 Shantakumaran Sreesanth, banned for life by the BCCI for his alleged role in spot-fixing, tells Harish Kotian//Rediff.com about his decision to join politics. Many expected the talented Shantakumaran Sreesanth to have a long and successful playing career for India. The Kerala pacer appeared destined for big things till the spot-fixing incident in IPL 2013 ended his bowling days. After suffering the humiliation of having to spend time in Delhi's Tihar jail for his alleged role in spot-fixing while playing for the Rajasthan Royals, he was subsequently banned for life by the Board of Control for Cricket in India. A trial court in Delhi cleared him of all charges last July, but the BCCI refused to lift the life ban on the pacer who played 27 Tests, 53 ODIs and 10 T20Is between 2005 and 2011 and was part of India's T20 World Cup-winning squad in 2007 and the 50-overs World Cup triumph in 2011. Out of cricket, the 33 year old has set his sights on a new innings. 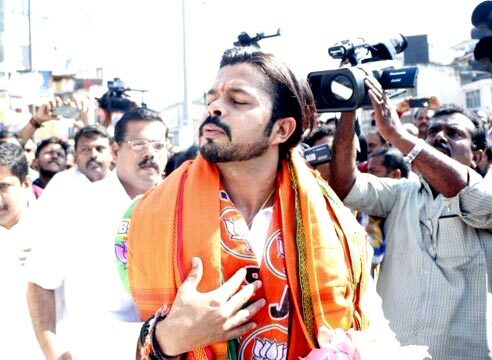 Following a foray into reality dance shows on television and a role in a Bollywood movie, Sreesanth, who asserts he is innocent of any wrongdoing in the spot-fixing scandal, plunged into politics. The maverick cricketer, who will contest next month's assembly polls in Kerala as a Bharatiya Janata Party candidate from Thiruvananthapuram Central, spoke to Harish Kotian/Rediff.com about politics and of a comeback to cricket. Why did you decide to join the BJP? It is a huge opportunity for me. The BJP is one of the strongest parties in India. It is not one of the... it is actually the strongest! Whichever states it has been ruling, it is doing really well. It is a good opportunity for me to be part of a family which has good things for people. I am really excited to join the BJP. I want to thank PM Narendra Modiji, (the BJP general secretary in charge of organisation) Ram Lalji, (BJP President) Amit Shahji and all the senior leaders in Kerala BJP who are standing by me and teaching me every day. How did you react when you were first made the offer to join the BJP? I was very excited. I wanted to make sure I give my very best in politics or not join at all. The moment I got to know I was getting a ticket from Trivandrum, which is the capital, I knew it was a great opportunity for me to change the lifestyle of people and give something back to society. There is so much I can do there; like infrastructure and all. With the support of the central government I can do a lot of things and really change the state and also make the difference in the lives of young people. Who convinced you to take the plunge? Actually, my father-in-law (Hirendra Singh Shekhawat) and Ram Lalji convinced me. I was lucky to meet PM Modi, Amit Shah, Arun Jaitley and Sushma Swaraj and other legends of the BJP. After speaking to them I was convinced and thought of entering politics and doing something for the people of Kerala. I never gave up even during the tough times. My family and friends stood by me. We waited for the bad times to get over. Similarly, in Kerala, I want to keep doing the same thing, not give up after one election or two elections, but stick to the BJP and make a difference in the lives of people. I am honoured that someone like PM Modi spoke to me so nicely for a long time. What did Modi tell you? Honestly, it was a personal conversation. They are looking forward towards me to bring a change in Kerala and I am ready for it. Were you also approached by the Congress? There were a lot of offers, but I wanted to be with a party that is working for the people and making them happy, not just by words, but also by action. I was always sure that I was going to join the BJP. Shashi Tharoor, the Congress MP from Thiruvanathapuram, says by not putting up a more credible candidate the BJP is essentially saying we give up the seat to the Congress. I only want to say thanks to Mr Shashi Tharoor for motivating me. I remember a lot of people had said back then that I won't play for the country. Not only did I play for India, but I also ended up winning a couple of World Cups. I think I am the only fast bowler in the whole world who has won both, the T20 and 50-overs World Cup. It has been a great journey and God has been kind to me. I have always respected Shashi Tharoor. He has always supported me and that shows what politics is. He can say whatever he wants. All I can say is that I am motivated by every criticism and they only make me stronger. What about the spot-fixing case? Will you continue to fight the life ban imposed by the BCCI or just concentrate on politics? I have got a complete clean chit from the court and that is what matters. Taking about the ban, right now I have got a much bigger responsibility of representing my constituency and helping my people. I will stick to politics for now. I am not worried about the ban as of now. So that means you won't approach the BCCI to get the life ban lifted and will just focus on politics? I am completely concentrating on politics right now. With cricket, I don't know. I have not thought about it. Right now, my focus is on winning the seat for the BJP. I am very confident that the people of Kerala will vote for me. After the ban you had said you want to play for India again and would do everything to achieve it. Have you given up on it? As I said earlier, there are a lot of things I am looking forward to. I have got a great opportunity to help people. My only focus at the moment is on the elections and winning the elections. How will you convince the people of Kerala to vote for you? You have around a month to win the trust of the people. Kerala has always been supporting me. They have always stood by me in my tough times. I am not a man who keeps saying things, but I work for the people even though I am not a chief minister or MLA. The people are aware of that and they know that if I win the elections and become a MLA, I will be much more powerful and will be able to help the people in a better way. After being banned from cricket, you participated in a dance show on television, you acted in a Bollywood movie and now you are entering politics. What kept you going despite all that you went through following the spot-fixing incident, which also saw being jailed and latter banned from cricket? I have just one life and I believe in not giving up ever, whether it is life, movies, politics or cricket. It is making sure you give your best every single day, every single moment and that is why I became a professional. I believe if you give your heart and soul to it you can be successful. If I will win the elections, I can bring about a change in people's lives with the help of the government. If I can bring the BJP to power in Kerala, then nothing like it. It will take time, but with great power comes greater responsibility and I am ready for it. As someone who was born and grew up in Kerala, how can the BJP win the trust of the people in the state? We need to concentrate on the youth and tackle unemployment in the state. We will need to focus on generating job opportunities and looking to target the next generation. There will be a lot of changes in the coming years, I am sure. There has been some amount of negativity about the BJP in recent months for a variety of reasons. Won't that affect your chances? If you look at the leaders in the BJP, most of them are quite young. That itself shows that the BJP is growing every day and becoming quite popular. It is about getting the right message to the right people and I am sure it will happen.